This is the basic recipe for fresh homemade egg pasta varieties. 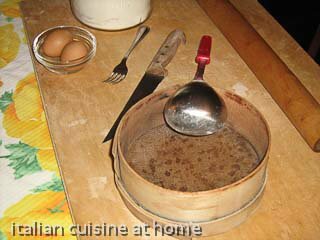 It is the authentic traditional recipe, very easy to make. Notes to the recipe: the doses for fresh egg pasta dough you find in our table are indicative. The flour is always influenced by many factors as the weather (more or less humidity) the temperature and the flour quality. Do not use the flour for making the bread. 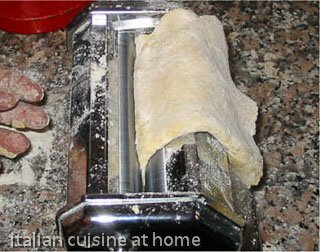 In Italy, flour is classified as 1, then 0 (used for the bread), and 00, and refers to how much finely the flour is milled and how much of the bran and germ have been removed. The quality 00 is called "doppio zero", in USA pastry flour and it is the most highly refined and is talcum-powder soft. 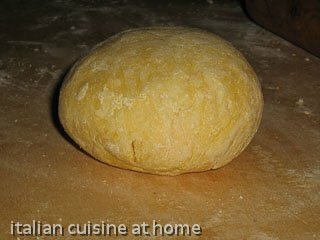 The 00 or pastry flour is used for the the egg pasta and for pasta dough without egg.